During its long history, Jerusalem has been attacked 52 times, captured and recaptured 44 times, besieged 23 times, and destroyed twice. The oldest part of the city was settled in the 4th millennium BCE, making Jerusalem one of the oldest cities in the world. Given the city's central position in both Israeli nationalism and Palestinian nationalism, the selectivity required to summarize more than 5,000 years of inhabited history is often influenced by ideological bias or background (see Historiography and nationalism). For example, the Jewish periods of the city's history are important to Israeli nationalists, whose discourse states that modern Jews originate and descend from the Israelites,[Note 1][Note 2] while the Islamic periods of the city's history are important to Palestinian nationalists, whose discourse suggests that modern Palestinians descend from all the different peoples who have lived in the region. [Note 3][Note 4] As a result, both sides claim the history of the city has been politicized by the other in order to strengthen their relative claims to the city, and that this is borne out by the different focuses the different writers place on the various events and eras in the city's history. Archaeological evidence suggests that the first settlement was established near Gihon Spring between 4500–3500 BCE. The first known mention of the city was in c. 2000 BCE in the Middle Kingdom Egyptian Execration Texts in which the city was recorded as Rusalimum. The root S-L-M in the name is thought to refer to either "peace" (compare with modern Salam or Shalom in modern Arabic and Hebrew) or Shalim, the god of dusk in the Canaanite religion. Archaeological evidence suggests that by the 17th century BCE, the Canaanites had built massive walls (4 and 5 ton boulders, 26 feet high) on the eastern side of Jerusalem to protect their ancient water system. By c. 1550–1400 BCE, Jerusalem had become a vassal to Egypt after the Egyptian New Kingdom under Ahmose I and Thutmose I had reunited Egypt and expanded into the Levant. The Amarna letters contain correspondence from Abdi-Heba, headman of Urusalim and his suzerain Amenhotep III. The power of the Egyptians in the region began to decline in the 12th century BCE, during the Bronze Age collapse. The Battle of Djahy (Djahy being the Egyptian name for Canaan) in 1178 BCE between Ramesses III and the Sea Peoples marked the beginning of this decline. The gradual loss of a central power gave rise to independent kingdoms in the region. According to the Bible, Jerusalem at this time was known as Jebus and its independent Canaanite inhabitants at this time were known as Jebusites. According to the Bible, the Israelite history of the city began in c. 1000 BCE, with King David's sack of Jerusalem, following which Jerusalem became the City of David and capital of the United Kingdom of Israel. According to the Books of Samuel, the Jebusites managed to resist attempts by the Israelites to capture the city, and by the time of King David were mocking such attempts, claiming that even the blind and lame could defeat the Israelite army. Nevertheless, the masoretic text for the Books of Samuel states that David managed to capture the city by stealth, sending his forces through a "water shaft" and attacking the city from the inside. Archaeologists now view this as implausible as the Gihon spring – the only known location from which water shafts lead into the city – is now known to have been heavily defended (and hence an attack via this route would have been obvious rather than secretive). The older Septuagint text, however, suggests that rather than by a water shaft, David's forces defeated the Jebusites by using daggers rather than through the water tunnels coming through the Gihon spring. There was another king in Jerusalem, Araunah, during, and possibly before, David's control of the city, according to the biblical narrative, who was probably the Jebusite king of Jerusalem. The city, which at that point stood upon the Ophel, was, according to the biblical account, expanded to the south, and declared by David to be the capital city of the Kingdom of Israel. David also, according to the Books of Samuel, constructed an altar at the location of a threshing floor he had purchased from Araunah; a portion of biblical scholars view this as an attempt by the narrative's author to give an Israelite foundation to a pre-existing sanctuary. Later, according to the biblical narrative, King Solomon built a more substantive temple, the Temple of Solomon, at a location which the Book of Chronicles equates with David's altar. The Temple became a major cultural centre in the region; eventually, particularly after religious reforms such as those of Hezekiah and of Josiah, the Jerusalem temple became the main place of worship, at the expense of other, formerly powerful, ritual centres, such as Shiloh and Bethel. However, according to K. L. Noll, in Canaan and Israel in Antiquity: A Textbook on History and Religion, the Biblical account of the centralization of worship in Jerusalem is a fiction, although by the time of Josiah, the territory he ruled was so small that the Jerusalem temple became de facto the only shrine left. Solomon is also described as having created several other important building works at Jerusalem, including the construction of his palace, and the construction of the Millo (the identity of which is somewhat controversial). Archaeologists are divided over whether the biblical narrative is supported by the evidence from excavations. Eilat Mazar contends that her digging uncovered remains of large stone buildings from the correct time period, while Israel Finkelstein disputes both the interpretation and the dating of the finds. When the Kingdom of Judah split from the larger Kingdom of Israel (which the Bible places near the end of the reign of Solomon, c. 930 BCE, though Israel Finkelstein and others dispute the very existence of a unified monarchy to begin with), Jerusalem became the capital of the Kingdom of Judah, while the Kingdom of Israel located its capital at Shechem in Samaria. Thomas L. Thompson argues that it only became a city and capable of acting as a state capital in the middle of the 7th century. Both the Bible and regional archaeological evidence suggest the region was politically unstable during the period 925–732 BCE. In 925 BCE, the region was invaded by Egyptian Pharaoh Sheshonk I of the Third Intermediate Period, who is possibly the same as Shishak, the first Pharaoh mentioned in the Bible who captured and pillaged Jerusalem. Around 75 years later, Jerusalem's forces were likely involved in an indecisive battle against the Neo-Assyrian King Shalmaneser III in the Battle of Qarqar. According to the bible, Jehoshaphat of Judah was allied to Ahab of the Northern Kingdom of Israel at this time. The Bible records that shortly after this battle, Jerusalem was sacked by Philistines, Arabs and Ethiopians, who looted King Jehoram's house, and carried off all of his family except for his youngest son Jehoahaz. Two decades later, most of Canaan including Jerusalem was conquered by Hazael of Aram Damascus. According to the Bible, Jehoash of Judah gave all of Jerusalem's treasures as a tribute, but Hazael proceeded to destroy "all the princes of the people" in the city. And half a century later, the city was sacked by Jehoash of Israel, who destroyed the walls and took Amaziah of Judah prisoner. By the end of the First Temple Period, Jerusalem was the sole acting religious shrine in the kingdom and a centre of regular pilgrimage; a fact which archaeologists generally view as being corroborated by the evidence, though there remained a more personal cult involving Asherah figures, which are found spread throughout the land right up to the end of this era. Jerusalem was the capital of the Kingdom of Judah for some 400 years. It had survived an Assyrian siege in 701 BCE by Sennacherib, unlike Samaria, the capital of the northern Kingdom of Israel, that had fallen some twenty years previously. According to the Bible, this was a miraculous event in which an angel killed 185,000 men in Sennacherib's army. According to Sennacherib's own account preserved in the Taylor prism, an inscription contemporary with the event, the king of Judah, Hezekiah, was "shut up in the city like a caged bird" and eventually persuaded Sennacherib to leave by sending him "30 talents of gold and 800 talents of silver, and diverse treasures, a rich and immense booty". The siege of Jerusalem in 597 BCE led to the city being overcome by the Babylonians, who then took the young King Jehoiachin into Babylonian captivity, together with most of the aristocracy. Zedekiah, who had been placed on the throne by Nebuchadnezzar (the Babylonian king), rebelled, and Nebuchadnezzar, who at the time (587/586 BCE) was ruler of a most powerful empire, recaptured the city, killed Zedekiah's descendants in front of him, and plucked out Zedekiah's eyes so that that would be the last thing he ever saw. The Babylonians then took Zedekiah into captivity, along with prominent members of Judah. The Babylonians then burnt the temple, destroyed the city's walls, and appointed Gedaliah son of Achikam as governor of Judah. After 52 days of rule, Yishmael, son of Netaniah, a surviving descendant of Zedekiah, assassinated Gedaliah after encouragement by Baalis, the king of Ammon. Some of the remaining population of Judah, fearing the vengeance of Nebuchadnezzar, fled to Egypt. According to the Bible, and perhaps corroborated by the Cyrus Cylinder, after several decades of captivity in Babylon and the Achaemenid conquest of Babylonia, Cyrus II of Persia allowed the Jews to return to Judah and rebuild the Temple. The books of Ezra-Nehemiah record that the construction of the Second Temple was finished in the sixth year of Darius the Great (516 BCE), following which Artaxerxes I sent Ezra and then Nehemiah to rebuild the city's walls and to govern the Yehud province within the Eber-Nari satrapy. These events represent the final chapter in the historical narrative of the Hebrew Bible. During this period, Aramaic-inscribed "Yehud coinage" were produced – these are believed to have been minted in or near Jerusalem, although none of the coins bear a mint mark. When Alexander the Great conquered the Persian Empire, Jerusalem and Judea fell under Greek control and Hellenistic influence. After the Wars of the Diadochoi following Alexander's death, Jerusalem and Judea fell under Ptolemaic control under Ptolemy I and continued minting Yehud coinage. In 198 BCE, as a result of the Battle of Panium, Ptolemy V lost Jerusalem and Judea to the Seleucids under Antiochus the Great. Under the Seleucids many Jews had become Hellenized and with their assistance tried to Hellenize Jerusalem, eventually culminating in a rebellion by the High Priest Matityahu ben Yoḥanan and his five sons: Simon, Yochanan, Eleazar, Jonathan and Yehuda ha-Makabi, also known as the Maccabees. As a result of the rebellion, Jerusalem became the capital of the independent Hasmonean Kingdom. The Hasmonean Kingdom lasted for 103 years. It was ruled by Simon Maccabaeus, the son of Matityahu; then by his son Yochanan, known as John Hyrcanus, who started minting his own Hasmonean coins; then by his son Yehuda Aristobulus; then by his wife Salome Alexandra; then by his brother Alexander Yannai; then by his sons Hyrcanus II and Aristobulus II. When the brothers Hyrcanus and Aristobulus each asked for Rome to intervene on their behalf, Judea fell under the greater rule of Rome as an autonomous province but still with a significant amount of independence. The last Hasmonean king was Aristobulus' son Antigonus II Matityahu. Prutah of Agrippa I. with Greek inscription "of king Agrippa"
In 37 BCE, Herod the Great captured Jerusalem after forty-day siege, ending Hasmonean rule. Herod ruled the Province of Judea as a client-king of the Romans, rebuilt the Second Temple, upgraded the surrounding complex, and expanded the minting of coins to many denominations. Pliny the Elder, writing of Herod's achievements, called Jerusalem "the most famous by far of the Eastern cities and not only the cities of Judea." The Talmud comments that "He who has not seen the Temple of Herod has never seen a beautiful building in his life." And Tacitus wrote that "Jerusalem is the capital of the Jews. In it was a Temple possessing enormous riches." Sack of Jerusalem. Inside wall from the Arch of Titus, Rome. The Menorah from the Temple is seen being carried in the victory procession. First Jewish revolt shekel issued in 68, saying "Shekel Israel, year 3", and on the reverse: "Jerusalem the Holy". Herod also built Caesarea Maritima which replaced Jerusalem as the capital of the Roman province. [Note 5] In 6 CE, following Herod's death in 4 BCE, Judea and the city of Jerusalem came under direct Roman rule through Roman prefects, procurators, and legates (see List of Hasmonean and Herodian rulers). Nevertheless, Herod's descendants remained nominal kings of Iudaea Province as Agrippa I (41–44) and Agrippa II (48–100). In 66 CE, the Jewish population rebelled against the Roman Empire in what is now known as the First Jewish–Roman War or Great Revolt. Roman legions under future emperor Titus reconquered and subsequently destroyed much of Jerusalem in 70 CE. Also the Second Temple was burnt and all that remained was the great external (retaining) walls supporting the esplanade on which the Temple had stood, a portion of which has become known as the Western Wall. Titus' victory is commemorated by the Arch of Titus in Rome. Agrippa II died c. 94 CE, which brought the Herodian dynasty to an end almost thirty years after the destruction of the Second Temple. After the end of this revolt, Jews continued to live in Jerusalem in significant numbers, and were allowed to practice their religion, only if they paid the Jewish Tax. In the 1st century CE, Jerusalem became the birthplace of Early Christianity. According to the New Testament, it is the location of the crucifixion, resurrection and Ascension of Jesus Christ (see also Jerusalem in Christianity). It was in Jerusalem that, according to the Acts of the Apostles, the Apostles of Christ received the Holy Spirit at Pentecost and first began preaching the Gospel and proclaiming his resurrection. Jerusalem eventually became an early centers of Christianity and home to one of the five Patriarchates of the Christian Church. After the Great Schism, it remained a part of the Eastern Orthodox Church. Bar Kokhba Revolt coinage, silver shekel with the Jewish Temple facade and a rising star, surrounded by "Shimon" (obverse). The reverse shows a lulav and the words "To the, freedom of Jerusalem". What is today known as the "Old City" was laid out by the Roman Emperor Hadrian in the 2nd century, when he began to rebuild Jerusalem as a pagan city. In 130, Hadrian visited the ruins of Jerusalem remaining after the First Jewish-Roman War of 66–73. He rebuilt the city, renaming it Aelia Capitolina in 135 CE. Hadrian placed the city's main Roman Forum at the junction of the main Cardo and Decumanus, now the location of the (smaller) Muristan. Hadrian built a large temple to Jupiter Capitolinus, which later became the Church of the Holy Sepulchre. He placed restrictions on some Jewish practices, which caused a revolt led by Simon Bar Kokhba. Hadrian responded with overwhelming force, putting down the rebellion, killing as many as a half million Jews, and resettling the city as a Roman colonia. Jews were forbidden to enter the city but for a single day of the year, Tisha B'Av, (the Ninth of Av), the fast day on which Jews mourn the destruction of both Temples. For the next 150 years, the city remained a relatively unimportant pagan Roman town. The Emperor Constantine, however, rebuilt Jerusalem as a Christian center of worship, building the Church of the Holy Sepulchre in 335. Jerusalem had received special recognition in Canon VII of the First Council of Nicaea in 325. Constantine's mother, Helena, made a pilgrimage to the city and claimed to have recovered the cross of Christ. Jews were still banned from the city throughout the remainder of its time as a Roman province, except during a brief period of Persian rule from 614 to 629. Although the Qur'an does not mention the name "Jerusalem", the hadith assert that it was from Jerusalem that Muhammad ascended to heaven in the Night Journey, or Isra and Miraj. The city was one of the Arab Caliphate's first conquests in 638 CE; according to Arab historians of the time, the Rashidun Caliph Umar ibn al-Khattab personally went to the city to receive its submission, cleaning out and praying at the Temple Mount in the process. Sixty years later the Dome of the Rock was built, a structure enshrining a stone from which Muhammad is said to have ascended to heaven during the Isra. 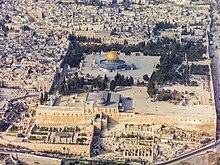 (The octagonal and gold-sheeted Dome is not the Al-Aqsa Mosque to the south, the latest version of which was built more than three centuries later). Umar ibn al-Khattab also allowed the Jews back into the city and freedom to live and worship after four hundred years. Under the early centuries of Muslim rule, especially during the Umayyad (650–750) and Abbasid (750–969) dynasties, the city prospered; geographers Ibn Hawqal and al-Istakhri (10th century) describe it as "the most fertile province of Palestine", while its native son, the geographer al-Muqaddasi (born 946) devoted many pages to its praises in his most famous work, The Best Divisions in the Knowledge of the Climes. Under Muslim rule Jerusalem did not achieve the political or cultural status enjoyed by the capitals Damascus, Baghdad, Cairo etc. Al-Muqaddasi derives his name from the Arabic name for Jerusalem, Bayt al-Muqaddas, which is linguistically equivalent to the Hebrew Beit Ha-Mikdash, the Holy House. The Haram Area (Noble Sanctuary) lies in the eastern part of the city; and through the bazaar of this (quarter) you enter the Area by a great and beautiful gateway (Dargah)... After passing this gateway, you have on the right two great colonnades (Riwaq), each of which has nine-and-twenty marble pillars, whose capitals and bases are of colored marbles, and the joints are set in lead. Above the pillars rise arches, that are constructed, of masonry, without mortar or cement, and each arch is constructed of no more than five or six blocks of stone. These colonnades lead down to near the Maqsurah. Under Az-Zahir's successur al-Mustansir Billah, the Fatimid Caliphate entered a period of instability and decline, as factions fought for power in Cairo. In 1071, Jerusalem was captured by the Turkish warlord Atsiz ibn Uvaq, who seized most of Syria and Palestine as part of the expansion of the Seljuk Turks throughout the Middle East. As the Turks were staunch Sunnis, they were opposed not only to the Fatimids, but also to the numerous Shia Muslims, who saw themselves removed from dominance after a century of Fatimid rule. In 1176, riots between Sunnis and Shiites in Jerusalem led to a massacre of the latter. Although the Christians of the city were left unmolested, and allowed access to the Christian holy sites, the wars with Byzantium and the general instability in Syria impeded the arrival pilgrims from Europe. The Seljuks also forbade the repair of any church, despite the damages suffered in the recent turmoils. There does not appear to have been a significant Jewish community in the city at this time. In 1086, the Seljuk emir of Damascus, Tutush I, appointed Artuk Bey governor of Jerusalem. Artuk died in 1091, and his sons Sökmen and Ilghazi succeeded him. In August 1098, while the Seljuks were distracted by the arrival of the First Crusade in Syria, the Fatimids under vizier al-Afdal Shahanshah appeared before the city and laid siege to it. After six weeks, the Seljuk garrison capitulated and was allowed to leave for Damascus and Diyar Bakr. The Fatimid takeover was followed by the expulsion of most of the Sunnis, in which many of them were also killed. Fatimid control of Jerusalem ended when it was captured by Crusaders in July 1099. The capture was accompanied by a massacre of almost all of the Muslim and Jewish inhabitants. Jerusalem became the capital of the Kingdom of Jerusalem. Godfrey of Bouillon, was elected Lord of Jerusalem on 22 July 1099, but did not assume the royal crown and died a year later. Barons offered the lordship of Jerusalem to Godfrey's brother Baldwin, Count of Edessa, who had himself crowned by the Patriarch Daimbert on Christmas Day 1100 in the basilica of Bethlehem. Christian settlers from the West set about rebuilding the principal shrines associated with the life of Christ. The Church of the Holy Sepulchre was ambitiously rebuilt as a great Romanesque church, and Muslim shrines on the Temple Mount (the Dome of the Rock and the al-Aqsa Mosque) were converted for Christian purposes. It is during this period of Frankish occupation that the Military Orders of the Knights Hospitaller and the Knights Templar have their beginnings. Both grew out of the need to protect and care for the great influx of pilgrims travelling to Jerusalem in the 12th century. The Kingdom of Jerusalem lasted until 1291; however, Jerusalem itself was recaptured by Saladin in 1187 (see Siege of Jerusalem (1187)), who permitted worship of all religions. According to Rabbi Elijah of Chelm, German Jews lived in Jerusalem during the 11th century. The story is told that a German-speaking Jew saved the life of a young German man surnamed Dolberger. Thus when the knights of the First Crusade came to besiege Jerusalem, one of Dolberger's family members rescued Jews in Palestine and carried them back to the German city of Worms to repay the favor. Further evidence of German communities in the holy city comes in the form of halakic questions sent from Germany to Jerusalem during the second half of the 11th century. In 1173 Benjamin of Tudela visited Jerusalem. He described it as a small city full of Jacobites, Armenians, Greeks, and Georgians. Two hundred Jews dwelt in a corner of the city under the Tower of David. In 1219 the walls of the city were razed by order of al-Mu'azzam, the Ayyubid sultan of Damascus. This rendered Jerusalem defenseless and dealt a heavy blow to the city's status. The Ayyubids destroyed the walls in expectation of ceding the city to the Crusaders as part of a peace treaty. In 1229, by treaty with Egypt's ruler al-Kamil, Jerusalem came into the hands of Frederick II of Germany. In 1239, after a ten-year truce expired, he began to rebuild the walls; these were again demolished by an-Nasir Da'ud, the emir of Kerak, in the same year. In 1243 Jerusalem came again into the power of the Christians, and the walls were repaired. The Khwarezmian Empire took the city in 1244 and were in turn driven out by the Ayyubids in 1247. In 1260 the Mongols under Hulagu Khan engaged in raids into Palestine. It is unclear if the Mongols were ever in Jerusalem, as it was not seen as a settlement of strategic importance at the time. However, there are reports that some of the Jews that were in Jerusalem temporarily fled to neighboring villages. In 1267 the Jewish Catalan sage Nahmanides travelled to Jerusalem. In the Old City he established the Ramban Synagogue, the second oldest active synagogue in Jerusalem, after that of the Karaite Jews built about 300 years earlier. In the middle of the 13th century, Jerusalem was captured by the Egyptian Mamluk Sultanate. The first provincial or superior of the Franciscan religious order, founded by Francis of Assisi, was Brother Elia from Assisi. In the year 1219 the founder himself visited the region in order to preach the Gospel to the Muslims, seen as brothers and not enemies. The mission resulted in a meeting with the sultan of Egypt, Malik al-Kamil, who was surprised by his unusual behaviour. The Franciscan Province of the East extended to Cyprus, Syria, Lebanon, and the Holy Land. Before the taking over of Acre (on 18 May 1291), Franciscan friaries were present at Acre, Sidon, Antioch, Tripoli, Jaffa, and Jerusalem. From Cyprus, where they took refuge at the end of the Latin Kingdom, the Franciscans started planning a return to Jerusalem, given the good political relations between the Christian governments and the Mamluk Sultanate of Egypt. Around the year 1333 the French friar Roger Guerin succeeded in buying the Cenacle (the room where the Last Supper took place) on Mount Zion and some land to build a monastery nearby for the friars, using funds provided by the king and queen of Naples. With two papal bullae, Gratias Agimus and Nuper Carissimae, dated in Avignon, 21 November 1342, Pope Clement VI approved and created the new entity which would be known as the Franciscan Custody of the Holy Land (Custodia Terrae Sanctae). The friars, coming from any of the Order's provinces, under the jurisdiction of the father guardian (superior) of the monastery on Mount Zion, were present in Jerusalem, in the Cenacle, in the church of the Holy Sepulcher, and in the Basilica of the Nativity at Bethlehem. Their principal activity was to ensure liturgical life in these Christian sanctuaries and to give spiritual assistance to the pilgrims coming from the West, to European merchants resident or passing through the main cities of Egypt, Syria, and Lebanon, and to have a direct and authorized relation with the Eastern Christianity Oriental communities. View and Plan of Jerusalem. A woodcut in the Liber Chronicarum Mundi (Nuremberg 1493). The monastery on Mount Zion was used by Brother Alberto da Sarteano for his papal mission for the union of the Oriental Christians (Greeks, Copts, and Ethiopians) with Rome during the Council of Florence (1440). For the same reason the party guided by Brother Giovanni di Calabria halted in Jerusalem on his way to meet the Christian Negus of Ethiopia (1482). In 1482, the visiting Dominican priest Felix Fabri described Jerusalem as "a dwelling place of diverse nations of the world, and is, as it were, a collection of all manner of abominations". As "abominations" he listed Saracens, Greeks, Syrians, Jacobites, Abyssinians, Nestorians, Armenians, Gregorians, Maronites, Turcomans, Bedouins, Assassins, a possible Druze sect and Mamluks. Christians and Jews alike in Jerusalem lived in great poverty and in conditions of great deprivation, there are not many Christians but there are many Jews, and these the Muslims persecute in various ways." Only the Latin Christians "long with all their hearts for Christian princes to come and subject all the country to the authority of the Church of Rome". In 1517, Jerusalem was taken over by the Ottoman Empire and enjoyed a period of renewal and peace under Suleiman the Magnificent, including the construction of the walls of what is now known as the Old City of Jerusalem (although some foundations were remains of genuine antique walls). The rule of Suleiman and subsequent Ottoman Sultans brought an age of "religious peace"; Jew, Christian and Muslim enjoyed freedom of religion and it was possible to find a synagogue, a church and a mosque on the same street. The city remained open to all religions, although the empire's faulty management after Suleiman the Magnificent meant economical stagnation. In 1700, Judah HeHasid led the largest organized group of Jewish immigrants to the Land of Israel in centuries. His disciples built the Hurva Synagogue, which served as the main synagogue in Jerusalem from the 18th century until 1948, when it was destroyed by the Arab Legion. [Note 6] The synagogue was rebuilt in 2010. Between 1703 and 1705, Jerusalem's Muslim religious leadership and the majority of its inhabitants revolted against the Ottoman governor of the district, Mehmed Pasha Kurd-Bayram in what became known as the Naqib al-Ashraf Revolt. During the course of the revolt, Jerusalem's residents administered their own affairs, engaging in virtual self-rule, until the central Ottoman authorities restored their control over the city. In the mid-19th century, with the decline of the Ottoman Empire, the city was a backwater, with a population that did not exceed 8,000. Nevertheless, it was, even then, an extremely heterogeneous city because of its significance to Judaism, Christianity, and Islam. The population was divided into four major communities – Jewish, Christian, Muslim, and Armenian – and the first three of these could be further divided into countless subgroups, based on precise religious affiliation or country of origin. The Church of the Holy Sepulchre was meticulously partitioned between the Greek Orthodox, Catholic, Armenian, Coptic, and Ethiopian churches. Tensions between the groups ran so deep that the keys to the shrine and its doors were safeguarded by a pair of 'neutral' Muslim families. At the time, the communities were located mainly around their primary shrines. The Muslim community surrounded the Haram ash-Sharif or Temple Mount (northeast), the Christians lived mainly in the vicinity of the Church of the Holy Sepulchre (northwest), the Jews lived mostly on the slope above the Western Wall (southeast), and the Armenians lived near the Zion Gate (southwest). In no way was this division exclusive, though it did form the basis of the four quarters during the British Mandate (1917–1948). Several changes with long-lasting effects on the city occurred in the mid-19th century: their implications can be felt today and lie at the root of the Israeli–Palestinian conflict over Jerusalem. The first of these was a trickle of Jewish immigrants from the Middle East and Eastern Europe. The first such immigrants were Orthodox Jews: some were elderly individuals, who came to die in Jerusalem and be buried on the Mount of Olives; others were students, who came with their families to await the coming of the Messiah, adding new life to the local population. At the same time, European colonial powers began seeking toeholds in the city, hoping to expand their influence pending the imminent collapse of the Ottoman Empire. This was also an age of Christian religious revival, and many churches sent missionaries to proselytize among the Muslim and especially the Jewish populations, believing that this would speed the Second Coming of Christ. Finally, the combination of European colonialism and religious zeal was expressed in a new scientific interest in the biblical lands in general and Jerusalem in particular. Archeological and other expeditions made some spectacular finds, which increased interest in Jerusalem even more. By the 1860s, the city, with an area of only one square kilometer, was already overcrowded. Thus began the construction of the New City, the part of Jerusalem outside of the city walls. Seeking new areas to stake their claims, the Russian Orthodox Church began constructing a complex, now known as the Russian Compound, a few hundred meters from Jaffa Gate. The first attempt at residential settlement outside the walls of Jerusalem was undertaken by Jews, who built a small complex on the hill overlooking Zion Gate, across the Valley of Hinnom. This settlement, known as Mishkenot Sha'ananim, eventually flourished and set the precedent for other new communities to spring up to the west and north of the Old City. In time, as the communities grew and connected geographically, this became known as the New City. 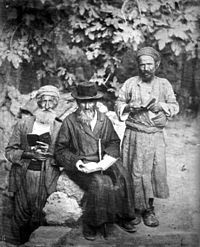 In 1882, around 150 Jewish families arrived in Jerusalem from Yemen. Initially they were not accepted by the Jews of Jerusalem and lived in destitute conditions supported by the Christians of the Swedish-American colony, who called them Gadites. In 1884, the Yemenites moved into Silwan. The British were victorious over the Ottomans in the Middle East during World War I and victory in Palestine was a step towards dismemberment of that empire. General Sir Edmund Allenby, commander-in-chief of the Egyptian Expeditionary Force, entered Jerusalem on foot out of respect for the Holy City, on 11 December 1917. By the time General Allenby took Jerusalem from the Ottomans in 1917, the new city was a patchwork of neighborhoods and communities, each with a distinct ethnic character. This continued under British rule, as the New City of Jerusalem grew outside the old city walls and the Old City of Jerusalem gradually emerged as little more than an impoverished older neighborhood. Sir Ronald Storrs, the first British military governor of the city, issued a town planning order requiring new buildings in the city to be faced with sandstone and thus preserving some of the overall look of the city even as it grew. During the 1930s, two important new institutions, the Hadassah Medical Center and Hebrew University were founded on Jerusalem's Mount Scopus. British rule marked, however, a period of growing unrest. Arab resentment at British rule and the influx of Jewish immigrants (by 1948 one in six Jews in Palestine lived in Jerusalem) boiled over in anti-Jewish riots in Jerusalem in 1920, 1929, and the 1930s that caused significant damage and several deaths. The Jewish community organized self-defense forces in response to the Jerusalem pogrom of April 1920 and later disturbances; while other Jewish groups carried out bombings and attacks against the British, especially in response to suspected complicity with the Arabs and restrictions on immigration during World War II imposed by the White Paper of 1939. The level of violence continued to escalate throughout the 1930s and 1940s. In July 1946 members of the underground Zionist group Irgun blew up a part of the King David Hotel, where the British forces were temporarily located, an act which led to the death of 91 civilians. On 29 November 1947, the United Nations General Assembly approved a plan which would partition the British Mandate of Palestine into two states: one Jewish and one Arab. Each state would be composed of three major sections, linked by extraterritorial crossroads, plus an Arab enclave at Jaffa. Expanded Jerusalem would fall under international control as a Corpus Separatum. The Jerusalem boundary in 1947 and the proposed boundary of a Corpus Separatum. After partition, the fight for Jerusalem escalated, with heavy casualties among both fighters and civilians on the British, Jewish, and Arab sides. By the end of March 1948, just before the British withdrawal, and with the British increasingly reluctant to intervene, the roads to Jerusalem were cut off by Arab irregulars, placing the Jewish population of the city under siege. The siege was eventually broken, though massacres of civilians occurred on both sides, before the 1948 Arab–Israeli War began with the end of the British Mandate in May 1948. The 1948 Arab–Israeli War led to massive displacement of Arab and Jewish populations. According to Benny Morris, due to mob and militia violence on both sides, 1,500 of the 3,500 (mostly ultra-Orthodox) Jews in the Old City evacuated to west Jerusalem as a unit. See also Jewish Quarter. The comparatively populous Arab village of Lifta (today within the bounds of Jerusalem) was captured by Israeli troops in 1948, and its residents were loaded on trucks and taken to East Jerusalem. The villages of Deir Yassin, Ein Karem and Malcha, as well as neighborhoods to the west of Jerusalem's Old City such as Talbiya, Katamon, Baka, Mamilla and Abu Tor, also came under Israeli control, and their residents were forcibly displaced; in some cases, as documented by Israeli historian Benny Morris and Palestinian historian Walid Khalidi, among others, expulsions and massacres occurred. In May 1948 the US Consul, Thomas C. Wasson, was assassinated outside the YMCA building. Four months later the UN mediator, Count Bernadotte, was also shot dead in the Katamon district of Jerusalem by the Jewish Stern Group. The United Nations proposed, in its 1947 plan for the partition of Palestine, for Jerusalem to be a city under international administration. The city was to be completely surrounded by the Arab state, with only a highway to connect international Jerusalem to the Jewish state. Concerning Jewish holy sites, Jordan breached its commitment to appoint a committee to discuss, among other topics, free access of Jews to the holy sites under its jurisdiction, mainly in the Western Wall and the important Jewish cemetery on the Mount of Olives, as provided in the Article 8.2 of the Cease Fire Agreement between it and Israel dated April 3, 1949. Jordan permitted the paving of new roads in the cemetery, and tombstones were used for paving in Jordanian army camps. The Cave of Shimon the Just became a stable. On 23 January 1950, the Knesset passed a resolution that stated Jerusalem was the capital of Israel. It is also the largest city in the country. 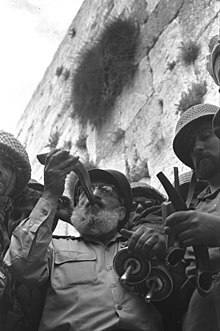 East Jerusalem was captured by the Israel Defense Forces during the 1967 Six-Day War. The Moroccan Quarter containing several hundred homes was demolished and its inhabitants expelled; thereafter a public plaza was built in its place adjoining the Western Wall. However, the Waqf (Islamic trust) was granted administration of the Temple Mount and thereafter Jewish prayer on the site was prohibited by both Israeli and Waqf authorities. Most Jews celebrated the event as a liberation of the city; a new Israeli holiday was created, Jerusalem Day (Yom Yerushalayim), and the most popular secular Hebrew song, "Jerusalem of Gold" (Yerushalayim shel zahav), became popular in celebration. Many large state gatherings of the State of Israel take place at the Western Wall today, including the swearing-in of various Israel army officers units, national ceremonies such as memorial services for fallen Israeli soldiers on Yom Hazikaron, huge celebrations on Yom Ha'atzmaut (Israel Independence Day), huge gatherings of tens of thousands on Jewish religious holidays, and ongoing daily prayers by regular attendees. The Western Wall has become a major tourist destination spot. Under Israeli control, members of all religions are largely granted access to their holy sites. The major exceptions being security limitations placed on some Arabs from the West Bank and Gaza Strip from accessing holy sites due to their inadmissibility to Jerusalem, as well as limitations on Jews from visiting the Temple Mount due to both politically motivated restrictions (where they are allowed to walk on the Mount in small groups, but are forbidden to pray or study while there) and religious edicts that forbid Jews from trespassing on what may be the site of the Holy of the Holies. Concerns have been raised about possible attacks on the al-Aqsa Mosque after a serious fire broke in the mosque in 1969 (started by Denis Michael Rohan, an Australian fundamentalist Christian found by the court to be insane). Riots broke out following the opening of an exit in the Arab Quarter for the Western Wall Tunnel on the instructions of the Israeli Prime Minister Benjamin Netanyahu, which prior Prime Minister Shimon Peres had instructed to be put on hold for the sake of peace (stating "it has waited for over 1000 years, it could wait a few more"). Conversely, Israeli and other Jews have showed concerns over excavations being done by the Waqf on the Temple Mount that could harm Temple Relics, particularly excavations to the north of Solomon's Stables that were designed to create an emergency exit for them (having been pressured to do so by Israeli authorities). Some Jewish sources allege that the Waqf's excavations in Solomon's Stables also seriously harmed the Southern Wall; however an earthquake in 2004 that damaged the eastern wall could also be to blame. The status of East Jerusalem remains a highly controversial issue. The international community does not recognize the annexation of the eastern part of the city, and most countries, including the US, maintain their embassies in Tel Aviv. The United States Congress has pledged to move its embassy to Jerusalem, subject to Presidential approval, which has not been forthcoming as the peace process continues. The United Nations Security Council Resolution 478 declared that the Knesset's 1980 "Jerusalem Law" declaring Jerusalem as Israel's "eternal and indivisible" capital was "null and void and must be rescinded forthwith". This resolution advised member states to withdraw their diplomatic representation from the city as a punitive measure. The council has also condemned Israeli settlement in territories captured in 1967, including East Jerusalem (see UNSCR 452, 465 and 741). Since Israel gained control over East Jerusalem in 1967, Jewish settler organizations have sought to establish a Jewish presence in neighborhoods such as Silwan. In the 1980s, Haaretz reports, the Housing Ministry "then under Ariel Sharon, worked hard to seize control of property in the Old City and in the adjacent neighborhood of Silwan by declaring them absentee property. The suspicion arose that some of the transactions were not legal; an examination committee ... found numerous flaws." In particular, affidavits claiming that Arab homes in the area were absentee properties, filed by Jewish organizations, were accepted by the Custodian without any site visits or other follow-up on the claims. ElAd, a settlement organization which Haaretz says promotes the "Judaization" of East Jerusalem, and the Ateret Cohanim organization, are working to increase Jewish settlement in Silwan in cooperation with the Committee for the Renewal of the Yemenite Village in Shiloah. ^ "No city in the world, not even Athens or Rome, ever played as great a role in the life of a nation for so long a time, as Jerusalem has done in the life of the Jewish people." ^ "For three thousand years, Jerusalem has been the center of Jewish hope and longing. No other city has played such a dominant role in the history, culture, religion and consciousness of a people as has Jerusalem in the life of Jewry and Judaism. Throughout centuries of exile, Jerusalem remained alive in the hearts of Jews everywhere as the focal point of Jewish history, the symbol of ancient glory, spiritual fulfillment and modern renewal. This heart and soul of the Jewish people engenders the thought that if you want one simple word to symbolize all of Jewish history, that word would be 'Jerusalem.'" ^ "Throughout history a great diversity of peoples has moved into the region and made Palestine their homeland: Canaanites, Jebusites, Philistines from Crete, Anatolian and Lydian Greeks, Hebrews, Amorites, Edomites, Nabateans, Arameans, Romans, Arabs, and European crusaders, to name a few. Each of them appropriated different regions that overlapped in time and competed for sovereignty and land. Others, such as Ancient Egyptians, Hittites, Persians, Babylonians, and Mongols, were historical 'events' whose successive occupations were as ravaging as the effects of major earthquakes ... Like shooting stars, the various cultures shine for a brief moment before they fade out of official historical and cultural records of Palestine. The people, however, survive. In their customs and manners, fossils of these ancient civilizations survived until modernity – albeit modernity camouflaged under the veneer of Islam and Arabic culture." ^ "(With reference to Palestinians in Ottoman times) Although proud of their Arab heritage and ancestry, the Palestinians considered themselves to be descended not only from Arab conquerors of the 7th century but also from indigenous peoples who had lived in the country since time immemorial, including the ancient Hebrews and the Canaanites before them. Acutely aware of the distinctiveness of Palestinian history, the Palestinians saw themselves as the heirs of its rich associations." ^ "When Judea was converted into a Roman province in 6 CE, Jerusalem ceased to be the administrative capital of the country. The Romans moved the governmental residence and military headquarters to Caesarea. The centre of government was thus removed from Jerusalem, and the administration became increasingly based on inhabitants of the Hellenistic cities (Sebaste, Caesarea and others)." ^ "This was not done in the heat of battle, but by official order. Explosives were placed carefully and thoughtfully under the springing points of the domes, of the great Hurva synagogue." ^ "Do We Divide the Holiest Holy City?". Moment Magazine. Archived from the original on 3 June 2008. Retrieved 5 March 2008. . According to Eric H. Cline’s tally in Jerusalem Besieged. ^ "Timeline for the History of Jerusalem". Jewish Virtual Library. American-Israeli Cooperative Enterprise. Retrieved 16 April 2007. ^ a b c Azmi Bishara. "A brief note on Jerusalem". Archived from the original on 5 December 2010. Retrieved 22 September 2010. ^ a b Daniel Pipes. "Constructing a Counterfeit History of Jerusalem". Retrieved 7 January 2011. ^ Teddy Kollek (1990). Jerusalem. Policy Papers. 22. Washington, DC: Washington Institute For Near East Policy. pp. 19–20. ISBN 9780944029077. ^ Eric H. Cline. "How Jews and Arabs Use (and Misuse) the History of Jerusalem to Score Points". Retrieved 22 September 2010. ^ Eli E. Hertz. "One Nation's Capital Throughout History" (PDF). Retrieved 22 September 2010. ^ Donald B. Redford, Egypt, Canaan, and Israel in Ancient Times, Princeton University Press, 1992 pp. 268, 270. ^ 2 Samuel 24:23, which literally has "Araunah the King gave to the King [David]". ^ Biblical Archaeology Review, Reading David in Genesis, Gary A. Rendsburg. ^ Peake's commentary on the Bible. ^ Rainbow, Jesse. "From Creation to Babel: Studies in Genesis 1–11" (PDF). RBL. Retrieved 22 April 2017. ^ Asaf Shtull-Trauring (6 May 2011). "The Keys to the Kingdom". Haaretz. ^ Amihai Mazar (2010). "Archaeology and the Biblical Narrative: The Case of the United Monarchy". In Reinhard G. Kratz and Hermann Spieckermann. One God, One Cult, One Nation (PDF). De Gruyter. Archived from the original (PDF) on 2010-11-26. ^ Israel Finkelstein (2010). "A Great United Monarchy?". In Reinhard G. Kratz and Hermann Spieckermann. One God, One Cult, One Nation (PDF). De Gruyter. Archived from the original (PDF) on 28 September 2013. ^ a b Israel Finkelstein & Neil Asher Silberman (2002). The Bible Unearthed: Archaeology's New Vision of Ancient Israel and the Origin of Its Sacred Texts. Simon and Schuster. ISBN 9780743223386. ^ Albright, William (1963). The Biblical Period from Abraham to Ezra: An Historical Survey. Harpercollins College Div. ISBN 0-06-130102-7. ^ A History of the Jewish People, ed. by H. H. Ben-Sasson, 1976, p. 247. ^ Ma'oz, Moshe and Nusseibeh, Sari. (2000). Jerusalem: Points of Friction, and Beyond Brill. pp. 136–38. ISBN 90-411-8843-6. ^ Elad, Amikam. (1995). Medieval Jerusalem and Islamic Worship Holy Places, Ceremonies, Pilgrimage Brill, pp. 29–43. ISBN 90-04-10010-5. ^ "The travels of Nasir-i-Khusrau to Jerusalem, 1047 C.E." Homepages.luc.edu. Archived from the original on 19 July 2011. Retrieved 13 July 2010. ^ Seder ha-Dorot, 1878, p. 252. ^ Epstein, in Monatsschrift, vol. xlvii, p. 344; Jerusalem: Under the Arabs. ^ a b c d e "Franciscans". Jewishvirtuallibrary.org. Retrieved 14 August 2012. ^ "cenacle - definition of cenacle by the Free Online Dictionary, Thesaurus and Encyclopedia". Thefreedictionary.com. Retrieved 14 August 2012. ^ "Custodia Terræ Sanctæ". Custodia.org. Archived from the original on 25 October 2012. Retrieved 14 August 2012. ^ "The Palestinian – Israel Conflict » Felix Fabri". Zionismontheweb.org. 9 September 2008. Retrieved 14 August 2012. ^ "Holy Land Custody". Fmc-terrasanta.org. 30 November 1992. Retrieved 14 August 2012. ^ "The Custody". Custodia.org. Retrieved 14 August 2012. ^ Moshe Safdie (1989) Jerusalem: the Future of the Past, Houghton Mifflin. ISBN 9780395353752. p. 62. ^ Tudor Parfitt (1997). The road to redemption: the Jews of the Yemen, 1900–1950. Brill's series in Jewish Studies, vol 17. Brill Academic Publishers. p. 53. ^ Fromkin, David (1 September 2001). A Peace to End All Peace: The Fall of the Ottoman Empire and the Creation of the Modern Middle East (2nd reprinted ed.). Owl Books e. pp. 312–13. ISBN 0-8050-6884-8. ^ Amos Elon, "Jerusalem: City of Mirrors". New York: Little, Brown 1989. ^ "Modern Israel & the Diaspora Timeline (1950-1959)". Jewishvirtuallibrary.org. Retrieved 14 August 2012. ^ "Elad in Silwan: Settlers, Archaeologists and Dispossession". mathaba.net. Archived from the original on 2012-09-08. ^ Seth Freedman. "Digging into trouble". The Guardian. ^ "Group 'Judaizing' East Jerusalem accused of withholding donation sources". Haaretz. 21 November 2007. ^ "11 Jewish families move into J'lem neighborhood of Silwan". Haaretz. 1 April 2004. Wikimedia Commons has media related to History of Jerusalem. Herbermann, Charles, ed. (1913). "Jerusalem (Before 71 CE)" . Catholic Encyclopedia. New York: Robert Appleton Company. This page was last edited on 27 November 2018, at 03:55 (UTC).